My altered item is a metal pop top can that I turned into a cute treat container! I had seen the idea on Pinterest and thought it would be a fun, unique project! Unfortunately, I forgot to take a before picture before I started. But, just to let you know, this started out as a can of peaches. You need one of those cans that has a pull top. Be sure to open the can from the BOTTOM with a safety can opener -- the type that doesn't leave sharp edges. I got mine a while back from QVC, but I think they shouldn't be too hard to find these days. You don't want to open the can using the pull top because you want to save that for the recipient of the treat container. Once you wash out and dry the inside of the can, go ahead and decorate it with patterned paper and whatever embellishments you wish to use. 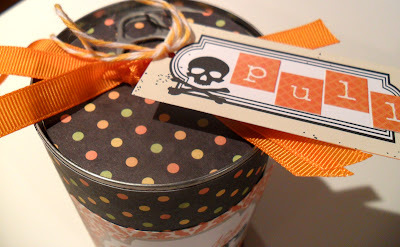 I kept this one simple and used a cardstock sticker from Echo Park's Apothecary Emporium line. For the top of the can, I cut out a circular piece of the same patterned paper. I did have to cut some slits and snip a little so it would slide under the tab, though. Now, this can had some words printed on the top. Because of that, I had to be sure to cover it with pp. If the can you use doesn't have any words, you could skip this step. I embellished the top with ribbon and then attached a tag from the same Echo Park line with twine. I used cardstock alpha stickers from the same set to spell the word 'PULL". At this point (or before you even decorate the top), the can is ready to be filled with candies or a small gift and then sealed by gluing the bottom lid back on. I have read that a lot of people use M & M's or other small candies. Personally, I feel a bit skittish about the idea of the glue possibly coming in contact with the candy, so I would probably use candies that are individually wrapped so they never come in direct contact with the glue. Some people have been using that E600 glue, which is really strong. However, it apparently emits a strong smell that can sometimes still be smelled when the can is later opened. For that reason, I would stick with hot glue. Of course, you can do whatever you like! I'm just giving some tips that might be helpful. I really like how this turned out. So did my teenager. In fact, she was thinking of using these to house her birthday party invitations later this year. 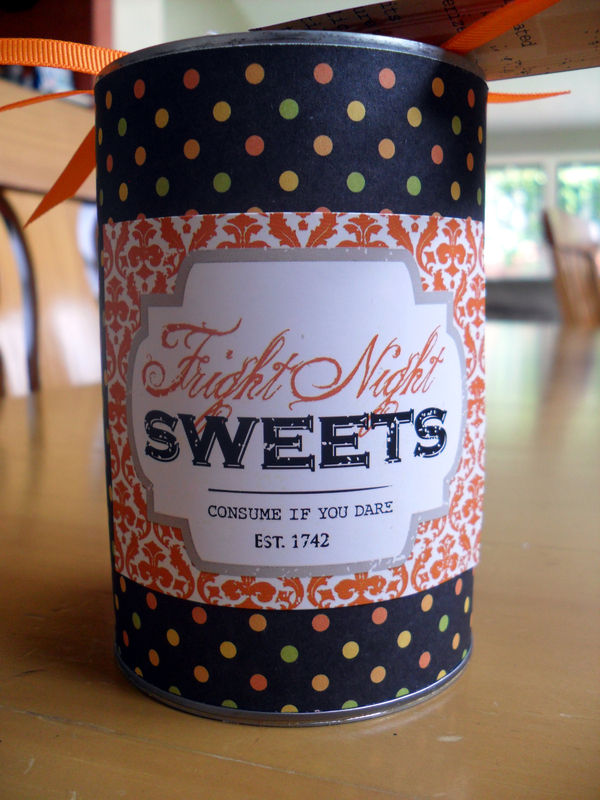 She was thinking of rolling each invitation into a scroll and then sealing each one in a can. She was also thinking that one of her friends might want to decorate some cans and use them for favors at her birthday party next month. As you can see, the decorated cans can be used for a variety of things! If any of you try this project, I'd love to see it! If you have any questions on the process, go ahead and leave a comment here and I'll get back to you as soon as I can. Don't forget to leave an email address for me to contact you! Thanks for looking! Don't forget to check out this weeks challenge over at Forever Night Challenges! what a fun container! love the echo park sticker! It's a very cute idea! And I love the paper you chose. Hmm now I want to go home and try it. Thanks!